"There are places I remember / all my life / though some have changed." Step right up to see the tiny horse. The tiny seahorse. 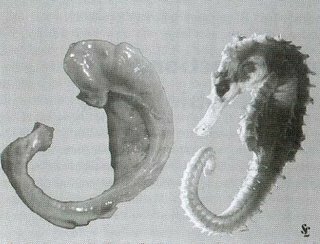 The brain structure mildly resembling a seahorse. The relatively large brain structure mildly resembling a ram's horn. Every time we think we get the hippocampus nailed down it squirms out of grasp. Anatomically and functionally it can be lumped in with a larger structural formation referred to as the hippocampal formation, or it can be divided into hippocampal subregions based around curving cell layers: the CA (cornu ammonis) fields, 1 and 3 being the clearest and best understood, and the dentate gyrus. There is too much to know about the hippocampus. It is studied for its pattern completing and separating computational properties, its rhythmic electrical field potential oscillations, its deceptively simple trisynaptic wiring diagram, its role in modulation of the stress response, the birth of new neurons in the adult dentate gyrus, the plasticity of its synapses, the response of its cells to spatial information, and its role in autobiographical memory of events. I will focus on the last two: spatial representation and episodic memory. Both aspects are areas of ongoing research generating controversy and debate within the field, and they have significant overlap. It may become apparent as we dig deeper that they are two sides of the same coin and that investigating each provides insight into the other. The contemporary era of hippocampus research really kicked off in the 60s and 70s. There were hints that the hippocampus might be related to memory before then, but a breakthrough came in 1957, when patient HM, suffering from intractable epilepsy for 11 years, had large portions of his medial temporal lobe on both sides removed to eliminate the epileptic foci. If you picture the brain as a boxing glove, the temporal lobe is where the thumb would be. The medial temporal lobe is the part of the temporal lobe nearer to the middle of the brain, where the thumb touches the rest of your brainfist. The hippocampus runs along the inner side of this lobe from thumbtip to thenar and, depending on the species might curve up to the first joint of the index finger. When HM had his medial temporal lobe removed his epilepsy was cured, but his memory was severely disrupted. Specifically, he could remember new experiences for a short time so long as he wasn't distracted, and he could remember experiences form his remote past. He was not capable of storing new long-term memories or recalling recent memories. Two major aspects of the hippocampus' relation to memory arose from studies with HM and other patients like him. One was the idea of memory taxonomy that separates memories that can be recalled as 'mental time travel' returning to the spatiotemporal context where the experience happened. This type of memory is referred to as episodic memory and contrasts with procedural memory, for instance, in which motor or coordination tasks are learnt. HM would probably be able to learn to ski, but he would not remember the process of learning. Memory taxonomy is not yet clear. A lot of terminology has been invented, but because recollection is a subjective experience it is hard to assay accurately in humans and especially hard to test for in animals. The second idea arising from HM's deficits was that of a temporally graded retrograde amnesia. The memories acquired more recently, in the years just prior to surgery were much more greatly affected than those from HM's childhood. This led to the idea that recently acquired memories spend some time stored in the hippocampus as a waystation before they take off to permanent storage sites in the synapses between various cortical neurons. The literature nowadays is conflicted and disconnected regarding the idea of a temporal gradient. It has taken a while to discover memory tasks that test the sort of memories we expect the hippocampus to handle. A favorite is contextual fear conditioning, but it is still frustratingly complex. A rat is supposed to learn about a context by combining all the information about its surroundings coming from different sensory processing areas into an index such that re-exposure to just a partial set of the initial context cues can reactivate the memory of the whole experience. To be concrete, if the context smells like acetic acid, the light is red, and there is a fan blowing in the background, the rat might just need the smell to bring all the rest of the context flooding back. In contextual fear conditioning, a rat learns to associated a context with shock, presumably via hippocampus to amygdala connections. A temporal gradient for contextual fear conditioning was reported in 1992 by Kim and Fanselow, now a classic, highly cited paper. They trained rats in this task and then lesioned the dorsal hippocampus at various times afterwards (retrograde lesions). The rats that received lesions a day after training forgot to be scared in the context, whereas rats that received lesions a month after retained their memory. This is a perfect analog for the story of HM in rat years. Recently acquired memories are more vulnerable to hippocampus lesions. The theory that the hippocampus is only a temporary memory storage site is called "systems consolidation". Remember how the hippocampus is supposed to pull together information from different sensory processing areas? In systems consolidation theory, the memory is rehearsed with those same areas until they get wired together and can reactivate the memory independent of the hippocampus. There are many reasons to like systems consolidation theory, but there are complexities. Here is one example. Kim and Fanselow didn't lesion the whole hippocampus. An alternative story to systems consolidation is the multiple trace theory. Rather than moving the memory out of the hippocampus, the memory representation could become distributed in the hippocampus up and down the dorsal-ventral axis making it more impervious to small lesions. Nadel and Moscovitch have been major proponents of the multiple trace theory and recently reviewed the human memory literature, even questioning the original interpretation of HM's deficits. One issue is how to ascertain whether a memory is truly episodic or is merely semantic (memory for facts that doesn't require autobiographical recollection; think rote memorization). For instance, I can tell you from my semantic memory what Neil Armstrong said after his first steps on the moon, but when he tells you the same thing he is re-living an episode from his life in a way that requires a type of processing that the hippocampus is especially good at. Using tests more sensitive to this distinction, HM has recently been reevaluated and found to have amnesia for episodic memory across his entire life. This is a potentially devastating blow for systems consolidation theory, but the discussion continues. New papers have reported temporal gradients for retrograde amnesia in other hippocampus dependent tasks in animal models. Studies using activation markers and multi-electrode recordings are providing new evidence of post-training hippocampal-cortical communications and coordination especially during sleep. Part of the reason the new multi-unit recording studies are so provocative is that they allow a strong link between our understanding of the hippocampus as a memory storage device and another major theory of the hippocampus: cognitive map theory. Perhaps the best way to understand the cognitive map theory of the hippocampus is to look at a place field. This is a two-dimensional map of an environment that some rat is exploring. The line tracks the path taken by the rat during the rat and marks red where firing of a particular cell rises above some threshold. Note that there is a bright red hotspot in the upper right hand corner. You would call this the place field for the cell being recorded in this experiment. O'Keefe and Dostrovsky provided the first observation of place cells in 1971. When they recorded electrical signals from the hippocampus of a rat as it explored an environment they found that some cells had a fairly low basal firing rate, but would fire much more rapidly while the rat was in a specific part of the environment. There is a cell in your hippocampus that fires when you are standing at the foot of your bed and another for when you are in your shower. Actually, the cells remap if the environment is distinguishable as an entirely new context, so you might have two separate maps for the bedroom and the bathroom. O'Keefe and Nadel built on the idea that the hippocampus is responsible for encoding spatial information to create the theory of the hippocampus as a cognitive map. They proposed that our perceptions help produce and are represented in relation to a spatial framework in the hippocampus which we use to figure out where we are and where we're going. In humans, the cognitive map is the framework for storing memory for events in a spatiotemporal context. You could imagine, for instance, that your location is the anchor for your memory of events. What's the most important thing to establish at the beginning of a work of fiction? The setting. The cognitive map theory is not without its critics and controversies, but I don't want to get bogged down in it. These are exciting times for place cell researchers. A great deal of enthusiasm has surrounded the discovery by the Moser lab in Trondheim, Norway of grid cells. Grid cells are very similar to place cells, but they serve a different purpose. They are found in the entorhinal cortex which is the last stop for sensory information being funneled down to the hippocampus. Rather than firing in one specific place field, grid cells have a triangular-grid shaped receptive field. Once again, it is easier to show than say. 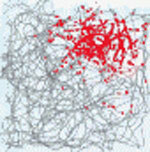 Grid cells solve the problem of navigation in a novel environment. Place cells are consistent within a familiar enviroment, but it takes a little while for them to form their preferences upon exposure to a new room. How does one keep track of position when you don't have a map yet? Zork fans know the answer. If you went two spaces north and two spaces east, you can go two spaces southwest and get back to the room where the elf stole your jeweled key or whatever. It's called path integration. You sum the vectors of your movements to add up to the total displacement from your starting point. To turn this into a map of the white house with a boarded front door, you might start with a fresh piece of graph paper. The regularly repeating structure of spatial representation in grid cells serves the same purpose. They provide a framework for you to build a map inside. A memory is more than just where you were though. It also includes a sequential order of events. Simultaneous recording of large numbers of place cells in the hippocampus has allowed the investigation of the sequential/temporal aspect of memory by way of patterns of spatial experience. I will provide one example from earlier this year. Foster and Wilson recorded from many place cells as a rat moved down a linear track like you or I would walk down a hallway. They move at relatively constant rate in one direction and eat some food at the end. The place cells that represented location during the previous trek down the hallway can fire action potentials while the rat is chillin' out at the end, eating his reward, and they do it in a rapid meaningful sequence. The cell closest to the end of the hallway kicks it off and the one at the beginning of the hallway is at the end. These and other sequentially organized patterns in the hippocampus might bring the firing in close enough proximity to be characterized as coinicidental. Coincidental firing is the first sign to the nervous system that maybe these two neurons ought to be hooked up to each other, so later when the memory of one portion of the hallway is recalled you are able to traverse across synaptic bridges to the rest of the house. There are also hints that this sort of sequential replay may occur during sleep and coincide with activation of neocortical areas, providing links between sleep, memory, and systems consolidation theory. Another popular example of the special relationship between space and the hippocampus is the story of the London cabbies. London cabbies have to memorize the spatial layout of the city to an incredible level of detail. Imaging studies have revealed the hippocampus of a London cabbie is shaped differently than your average person; some parts are bigger and some are smaller. Greater volume differences are associated with more years of experience as a taxi driver. The obvious implication is that learning and using all those map details really works out their space muscles, growing more cells or larger cells in the hippocampus, and reorganizing according to the demand. This isn't entirely implausible since the hippocampus is one of only two confirmed sources of newborn neurons in the adult brain. There are alternatives though: the simple act of driving in the city with the attendant stress, motor planning, and cognitive demands might affect the hippocampus. A recent update attempted to control for these issues by comparing cabbies who have to really know the maps to bus drivers who do the same amount of driving without the memorization requirements. The volume differences hold up, and what's more, taxi drivers had more trouble learning new spatial information. This finding hints that there may actually be a limit to storage capacity for spatial information, which is not something we run up against day-to-day. Of course, the caveat that correlation is not causation remains. People with funny-shaped hippocampi might just have a predisposition to become cabbies and stick with it, but the study authors point to some evidence suggesting that initial spatial capabilities don't correlate with hippocampus shape suggesting that this alternative isn't strongly supported. Memory for places or places for memory? The discovery of place cells clearly indicated that the hippocampus represents where we are, but the discovery of grid cells in the entorhinal cortex reallocates a good-sized portion of that responsibility. Why then are the cells that should be handling memory wasting their time representing spatial location at all? One possibility is that location is the framework in which we embed our memories. A recent issue of the journal, Hippocampus, contained a collection of articles suggesting a strong correspondence if not isomorphism between the characteristics of place cells and memory. Sheri Mizumori provided an excellent introductory article profiling areas of overlap and distinguishing features of these two processes. For instance, certain drugs affect memory and place field representation in the same direction, and place fields become more refined as rats gain more experience in an environment. As a more concrete example, a study in 2003 reported changes in the response properties of place cells after fear conditioning. After establishing the place field representation in exploring, the study's authors delivered a tone paired with an aversive stimulus. Afterwards, place cells became responsive to tone and location. The cells of the hippocampus are capable of responding to more than just place, but place still held a primary role. A cell could only fire in response to the tone if the rat was in its particular preferred location. Exploration of the hippocampus' abilities continues. I have not scratched the surface even in this mega-post. The theories of the hippocampus as a memory storage device and a cognitive map are not mutually exclusive and may turn out to be one and the same. I came to an interest in the hippocampus via a more philosophical route: considering the role of memory in the definition of the self and such, but there are plenty of noble non-navel-gazing reasons to delve deep into this structure as well. The hippocampus shows signs of damage and deterioration early on in Alzheimer's disease and other forms of dementia, and the same recurrent excitatory connectivity so useful for memory storage may also provide the substrate for the electrical storms underlying epilepsy. I hope you now have some more of the conceptual framework necessary for reading and evaluating new hippocampus articles, and we can talk about it some more when good studies come out. Now make like a hippocampectomized rat and get lost!